Biodiversity — the unique variety of life on our planet — underpins our economy and well-being. It provides us with clean air and water, food, materials and medicines, health and recreation; it supports pollination and soil fertility, regulates climate and protects us from extreme weather. The EU 2010 biodiversity baseline 4 indicated that up to 25 % of European animal species were facing extinction, and 65 % of habitats of EU importance were in an unfavourable conservation status, mainly due to human activities. Basic ecosystem services have continued deteriorating. As a response, in 2011, the European Commission adopted an EU biodiversity strategy to 2020, 5 with the headline target set by EU Heads of State and Government to ‘halt the loss of biodiversity and ecosystem services by 2020, to restore ecosystems in so far as is feasible, and to step up the EU contribution to averting global biodiversity loss’. The strategy is an integral part of the Europe 2020 strategy 6 and the 7th Environmental Action Programme. 7 It implements EU commitments under the Convention on Biological Diversity. The strategy is built around six targets, each supported by a set of actions. The present mid-term review takes stock of progress in implementing the EU biodiversity strategy against the 2010 baseline. It aims to inform decision-makers of areas in which increased efforts are needed to meet the EU biodiversity objectives by 2020. 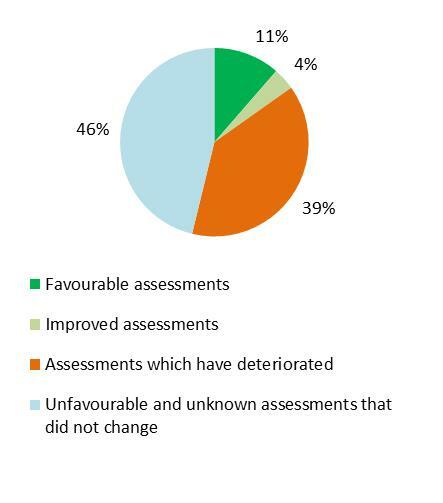 The assessment of progress in the mid-term review takes account of the way that the different targets are defined. The headline target is formulated in terms of the desired state of biodiversity and ecosystem services in the EU by 2020. Progress towards this target at the point of the mid-term review has been assessed in terms of both status and trends. The six operational targets have both policy-related and status-related elements. The assessment under each of these targets presents: (i) where we stand at mid-term; (ii) what action has been implemented; and (iii) gaps and further efforts needed to reach the target by 2020. The mid-term review draws on the best available information from a wide range of sources summarised in the accompanying Staff Working Document. 12 Trends in status of habitats and species of EU importance are based on data reported under the Birds and Habitats Directives (period 2007-2012 vs 2001-2006 13 ). Headline target: Halt the loss of biodiversity and the degradation of ecosystem services in the EU by 2020, and restore them in so far as feasible, while stepping up the EU contribution to averting global biodiversity loss. Overall, as compared with the EU 2010 biodiversity baseline, biodiversity loss and the degradation of ecosystem services in the EU have continued, as confirmed by the 2015 European environment — state and outlook report. 14 This is consistent with global trends and has serious implications for the capacity of biodiversity to meet human needs in the future. While many local successes demonstrate that action on the ground delivers positive outcomes, these examples need to be scaled up to have a measurable impact on the overall negative trends. Since the last reporting period, the number of species and habitats of EU importance with secure/favourable or improved conservation status has increased slightly. Populations of some common birds appear to be stabilising but other species linked to fragile freshwater, coastal and agricultural ecosystems continue to decline; 70 % of EU species are threatened by habitat loss. While some ecosystem services (in particular provisioning) are increasing, others such as pollination are decreasing. The key threats to biodiversity — habitat loss (in particular through urban sprawl, agricultural intensification, land abandonment, and intensively managed forests), pollution, over-exploitation (in particular fisheries), invasive alien species and climate change — continue to exert pressure causing loss of species and habitats and resulting in ecosystem degradation and weakening ecosystem resilience. 15 The EU-28 footprint is still over twice its biocapacity 16 and this compounds pressures on biodiversity outside Europe. Since the launch of the strategy, progress has been made in establishing policy frameworks, improving the knowledge base and setting up partnerships. These initiatives will need to be translated into concrete actions at national, regional and local levels if we are to see sustained improvements in biodiversity on the ground. Progress towards the headline target will also depend on the setting and achievement of objectives in policy areas not directly targeted by the strategy, notably climate, air, chemicals, water, and soil protection. There is ample evidence of major efforts by stakeholders that have resulted in positive local trends in biodiversity. These examples send an important message that targeted action on the ground can bring very positive results. They provide models for guiding implementation in the second half of the strategy. 2.1.Target 1: Halt the deterioration in the status of all species and habitats covered by EU nature legislation and achieve a significant and measurable improvement in their status so that, by 2020, compared with current assessments: (i) 100 % more habitat assessments and 50 % more species assessments under the Habitats Directive show an improved conservation status; and (ii) 50 % more species assessments under the Birds Directive show a secure or improved status. The latest report on the state of nature in the EU 17 shows that the number of species and habitats in secure/favourable or improved conservation status has increased slightly since the 2010 baseline. However, many habitats and species that were already in unfavourable status remain so, and some are deteriorating further. While much has been achieved since 2011 in carrying out the actions under this target, the most important challenges remain the completion of the Natura 2000 marine network, ensuring the effective management of Natura 2000 sites, and securing the necessary finance to support the Natura 2000 network. As indicated in Figure 1 above, more species and habitats covered by EU nature legislation show a secure/favourable or improving conservation status since the 2010 baseline. Some emblematic species, such as the Eastern Imperial Eagle, show recovery as a result of targeted conservation measures supported by dedicated financing. However, the status of many other species and habitats remains unfavourable, with some declining trends. The Natura 2000 network has been largely completed for terrestrial and inland water habitats, covering about 18 % of the land surface. The marine network coverage has increased to 6 %, still well below the 10 % global target. Member States have progressed at different rates in developing and implementing action plans for species and Natura 2000 site management plans. 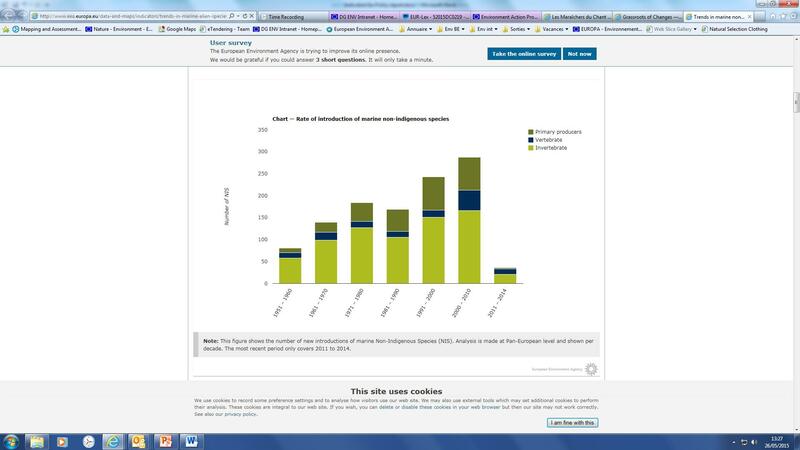 In 2012, only 58 % of Natura 2000 sites had management plans, or had such plans in development. 18 The Natura 2000 biogeographical process has encouraged cooperation between Member States on habitat management and restoration, and financing opportunities for Natura 2000 sites have increased. 19 A full assessment of the integration of Natura 2000 in the new multiannual financial framework will only be possible once all programmes have been approved. Training was organised for judges and prosecutors on the enforcement of key provisions of nature legislation. Major improvements have been seen in the monitoring and reporting of biodiversity data, and in streamlining the reporting requirements under the two nature directives. Communication and awareness raising have been stepped up with the launch of the Natura 2000 communication platform, an annual Natura 2000 award scheme and national campaigns. The Commission is undertaking a fitness check of the Birds and Habitats Directives 21 as part of its regulatory fitness and performance programme. This will be a comprehensive and evidence-based analysis of whether the legislation and its implementation are proportionate to the set objectives and are delivering as intended. The results will be presented in the first half of 2016. While it will take time for the positive effects of many of these actions to become apparent, it is clear that significantly more efforts and investment will be needed in the remaining period up to 2020, so as to complete Natura 2000 in marine areas to achieve the 10 % global target, ensure that all Natura 2000 sites are managed effectively, and establish adequate financial and administrative conditions to achieve conservation objectives and allow the potential of ecosystem services to deliver within and beyond the territories of Natura 2000. 2.2.Target 2: By 2020, ecosystems and their services are maintained and enhanced by establishing green infrastructure and restoring at least 15 % of degraded ecosystems. Progress has been made on policy and knowledge improvement actions under this target, and some restoration activities have taken place in Member States. However, this has not yet halted the trend of degradation of ecosystems and services. National and regional frameworks to promote restoration and green infrastructure need to be developed and implemented. A lot remains to be done to halt the loss of ordinary biodiversity outside the Natura 2000 network. *NB: results for marine ecosystem are preliminary. Recent analysis 23 confirms increasing trends for some provisioning services (e.g. timber production) and decreasing trends for services directly related to biodiversity (e.g. pollination) for the period between 2000-2010. As illustrated in Figure 2, some major pressures on ecosystems are decreasing (e.g. atmospheric deposition of sulphur); however, other threats to ecosystems and their services persist and many are increasing, thereby slowing overall progress towards the target. The Commission and Member States have taken important steps to improve the knowledge base. The mapping and assessment of ecosystems and their services, when completed by the 2020 target, will allow public decision-makers and private-sector stakeholders to capture the value of the EU’s ecosystem wealth and associated socio-economic benefits in their planning decisions. The Joint Research Centre report provides a solid baseline against which progress will be tracked, with a first update expected in 2016. The EU green infrastructure strategy 24 promotes the integration of green infrastructure solutions into other EU policies and financing instruments. The Commission has also published a study 25 to support Member States in prioritising the restoration of degraded ecosystems. Although there are few comprehensive restoration strategies at national and sub-national levels, some restoration is taking place — often in response to EU legislation such as the Water Framework Directive, the Marine Strategy Framework Directive, and the Birds and Habitats Directives. Over the coming years, increased efforts will be needed to complete and implement national restoration prioritisation frameworks. Further investments, coupled with capacity building and the integration of green infrastructure into national and sub-national planning frameworks, will be important drivers to maintain and restore ecosystems and their services. A lot remains to be done in relation to halting the loss of ordinary biodiversity in the 80 % of the EU territory falling outside of Natura 2000, which will require consideration of the most suitable approach to ensure no net loss of biodiversity and ecosystem services. 2.3.Target 3: Increase the contribution of agriculture and forestry to maintaining and enhancing biodiversity. 2.3.1.Target 3A — Agriculture: By 2020, maximise areas under agriculture across grasslands, arable land and permanent crops that are covered by biodiversity-related measures under the CAP so as to ensure the conservation of biodiversity and to bring about a measurable improvement* in the conservation status of species and habitats that depend on or are affected by agriculture and in the provision of ecosystem services as compared to the EU 2010 Baseline, thus contributing to enhance sustainable management. (*) Improvement is to be measured against the quantified enhancement targets for the conservation status of species and habitats of EU interest in Target 1 and the restoration of degraded ecosystems under Target 2. The CAP reform for 2014-2020 provides a range of instruments that can contribute to supporting biodiversity. If the target is to be achieved, these opportunities need now to be taken up by Member States on a sufficient scale. Local examples demonstrate successful sustainable agricultural practices. If implemented more broadly, they could put the EU back on track to achieve the target by 2020. The 2015 European environment — state and outlook report identifies intensification in agricultural practices and land abandonment, along with urban sprawl and grey infrastructure, as key pressures on biodiversity. The 2015 report The State of Nature in the European Union also points to agriculture and human-induced modifications of natural conditions as the most prominent pressures on terrestrial ecosystems in the period 2007-2012, with 20 % of the pressure stemming from agriculture alone. As illustrated in Figure 3, there has been no measurable improvement in the status of the majority of agriculture-related species and habitats covered by EU nature legislation since the last reporting period. Grasslands and wetlands have the highest proportion of habitats in ‘unfavourable — bad’ or ‘deteriorating’ status. While populations of common bird species have started stabilising since 2010, farmland birds have continued declining. Pollination services are in steep decline 27 with multiple pressures on wild bees. 28 Grassland butterflies are declining severely and there is no sign of levelling off. While overall trends continue to be a cause for serious concern, there are many local improvements as a direct result of good agricultural practices and biodiversity measures under the CAP, in particular under the agri-environment measures and in Natura 2000 sites. 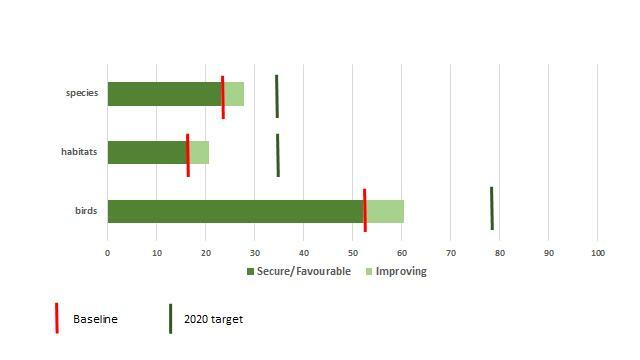 Such successes carry an important message on the achievability of the 2020 biodiversity target, but would need to be spread wider to achieve measurable results at EU level. The CAP reform for 2014-2020 includes various instruments that can contribute to support biodiversity. Cross-compliance represents the basic layer of environmental requirements and obligations to be met by farmers. Direct payments reward the delivery of environmental public goods. One of the three greening practices under the first pillar — ecological focus areas — specifically targets biodiversity. Finally, the Rural Development Regulation 29 provides national and regional authorities with a wide range of biodiversity-favourable options to choose from. These options include a sub-priority on the restoration, preservation and enhancement of ecosystems, a target for biodiversity output in rural development programmes, collaboration mechanisms among farmers and foresters, and a greater focus on advising farmers on water and pesticide use but also on biodiversity, including the obligations under the Birds and Habitats Directives. The reformed CAP gives Member States’ national and regional authorities the flexibility to decide how and to what extent they take up these opportunities. Member States’ rural development programmes and choices related to ecological focus areas will be carefully monitored and evaluated with respect to biodiversity protection. Based on programmes adopted at the time of finalising this report, 19.1 % 30 of total agricultural land is under management contracts supporting biodiversity and/or landscapes, with very large disparities among Member States and regions. Understanding the reasons for disparity in take-up among Member States will be critical for further progress towards the 2020 target. 2.3.2.Target 3B — Forests: By 2020, Forest Management Plans or equivalent instruments, in line with Sustainable Forest Management (SFM), are in place for all forests that are publicly owned and for forest holdings above a certain size** (to be defined by the Member States or regions and communicated in their Rural Development Programmes) that receive funding under the EU Rural Development Policy so as to bring about a measurable improvement* in the conservation status of species and habitats that depend on or are affected by forestry and in the provision of related ecosystem services as compared to the EU 2010 Baseline. EU forest area has increased as compared with the EU 2010 biodiversity baseline. However, the conservation status of forest habitats and species covered by EU nature legislation shows no significant signs of improvement. EU-level data on the status of forest habitats outside Natura 2000 is limited. Forest management plans or equivalent instruments can play an important positive role in achieving the target, but their potential remains largely unused. Favourable conservation status assessments of forest habitats of European importance have decreased from nearly 17 % to about 15 % in the latest assessment. 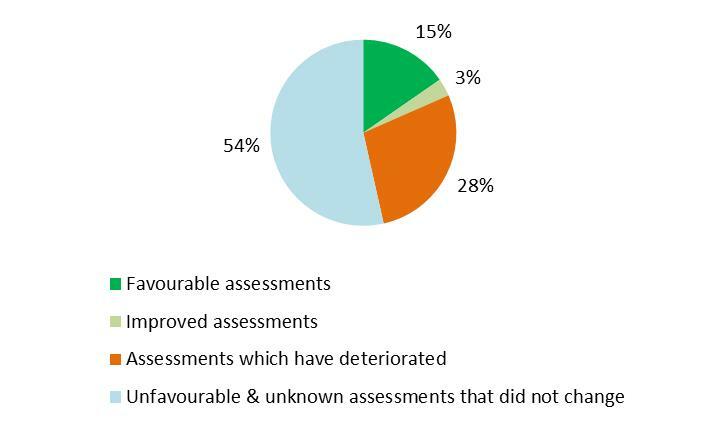 The vast majority of assessments remain unfavourable (80 %) but results vary considerably across Europe’s biogeographical regions, with the highest proportion of favourable assessments being found in the Mediterranean region. The EU forest strategy 32 highlights the economic, social and environmental importance of Europe’s forest ecosystems and sets the guiding principles of sustainable forest management, resource efficiency and global forest responsibility. The Commission is also developing criteria and indicators for sustainable forest management. Securing adequate funding for biodiversity-favourable measures in forested areas remains a challenge. During the period 2007 to 2013, a total of EUR 5.4 billion was allocated to forests under rural development programmes whereas the annual cost of managing the Natura 2000 network (of which over half is forest) is around EUR 5.8 billion. Forest management plans or equivalent instruments could play a key role in achieving Target 3B, including in private forests. Overall, a large share of EU forests is covered by some form of management plan but there nevertheless remain significant variations across the Member States. The take-up of some of the measures identified in the EU biodiversity strategy has been limited. Improving EU-level information on forest status will allow a more precise assessment of the situation and the design of appropriate policy responses to meet the target. 2.4.Target 4: Achieve Maximum Sustainable Yield (MSY) by 2015*. Achieve a population age and size distribution indicative of a healthy stock, through fisheries management with no significant adverse impacts on other stocks, species and ecosystems, in support of achieving Good Environmental Status by 2020, as required under the Marine Strategy Framework Directive (MSFD). * The reformed Common Fisheries Policy (CFP) which entered into force in 2014, aims to ensure MSY exploitation rates for all stocks by 2015 where possible, and at the latest by 2020. Significant progress has been made in setting the policy framework for sustainable fisheries under the reformed EU common fisheries policy, and for achieving good environmental status under the MSFD. The Commission is promoting improvements in oceans governance for more sustainable management of marine resources. However, policy implementation has been uneven across the EU and major challenges remain to ensure that the objectives are achieved according to schedule. Just over 50 % of MSY-assessed stocks were fished sustainably in 2013. As a result of multiple pressures, marine species and ecosystems continue declining across Europe’s seas. Fishing mortality has significantly decreased for a number of stocks in the Baltic and the greater North Sea. 34 This is evidence that they are responding positively to the implementation of long-term management plans and fishing practices respecting the MSY objective. In support of reducing the adverse impact of fishing on non-target species and ecosystems, the new common fisheries policy aims — through the gradual introduction of a landing obligation by 2019 — to eliminate discarding. This will require strengthened monitoring at Member State level in order to lead to practices that are cleaner, more selective and which avoid by-catch, and to improve by-catch data. Continued efforts at the national level to implement management plans and monitor the enforcement of rules will be paramount in addressing pressures on marine biodiversity by 2020, along with improved monitoring, broadening the knowledge base and coordination of marine biodiversity information. Building on experience and expanding research networks will be a key task. 2.5.Target 5: By 2020, Invasive Alien Species (IAS) and their pathways are identified and prioritised, priority species are controlled or eradicated, and pathways are managed to prevent the introduction and establishment of new IAS. Invasive alien species are a fast-growing threat to biodiversity. The IAS Regulation 36 entered into force in 2015. Work is under way to propose the first list of invasive alien species of Union concern. If this list is adopted by the end of 2015, the EU can be considered to be on track with the actions envisaged under Target 5. The next critical step for achieving the target will be implementation by Member States. Ratification of the Ballast Water Convention, crucial for addressing marine invasive alien species, is slow-going with only 7 Member State ratifications to date. Currently, there are more than 11 000 alien species in the European environment and 10-15 % of them are causing problems. In the seas around Europe, more than 80 % of non-indigenous species have been introduced since 1950 (see Figure 5 ). The new IAS Regulation provides a framework to prevent and manage the introduction and spread of invasive alien species in the EU. The European Alien Species Information Network 38 is being set up to assist Member States in its implementation. Work is under way with Member States to finalise the first list of invasive alien species of Union concern based on species’ risk assessments, including potential economic threats. A scanning exercise to prioritise future risk assessments will support a preventive approach. The Commission's 2013 proposals on plant 39 and animal 40 health also aim to support biodiversity protection. The swift adoption of the first list of invasive alien species of Union concern and effective implementation by the Member States will be decisive for continued progress towards this target. Progress on related policies will be crucial, in particular the ratification and enforcement of the Ballast Water Convention and the application of the animal health regime for wildlife diseases. 2.6.Target 6: By 2020, the EU has stepped up its contribution to averting global biodiversity loss. The EU is the largest contributor to biodiversity-related official development assistance and has more than doubled funding between 2006 and 2013. In order to regulate access to genetic resources and the fair and equitable sharing of benefits arising from their utilisation, the EU ratified the Nagoya Protocol in 2014. New legislation has been adopted to regulate compliance measures, and an additional implementing act is being prepared. The 2013 EU Timber Regulation aims to stop the circulation of illegally logged wood on the EU market. The EU Forest Law Enforcement, Governance and Trade Plan encourages trade in legal timber. There is a growing consumer preference for products from sustainably managed forests. 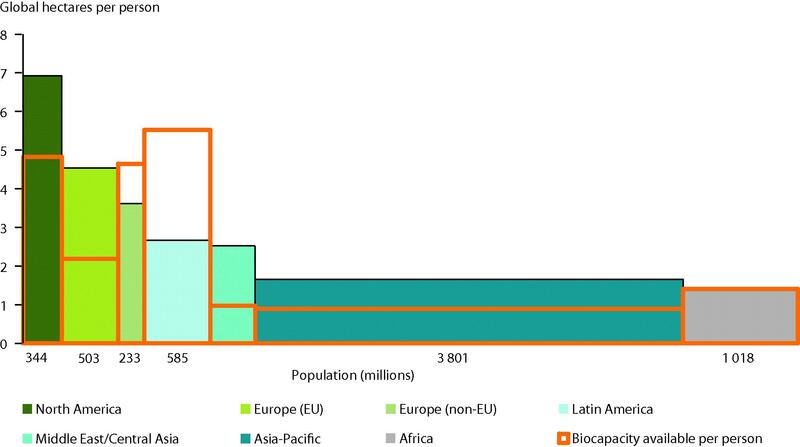 Some progress has also been made on palm oil, but too little action has been taken regarding other commodities and the EU-28 footprint is over twice the size of its biocapacity. All recent EU free trade agreements have provisions on the implementation of multilateral environmental agreements. The EU has also supported global efforts against wildlife trafficking, 43 including promoting progress towards the adoption of a comprehensive UN General Assembly Resolution on tackling illicit trafficking in wildlife. On 8 July 2015, the EU officially became a Party to the Convention on International Trade in Endangered Species of Wild Fauna and Flora. Actions to biodiversity-proof EU development cooperation have been addressed through the mainstreaming of environment and climate change. A compulsory environmental screening for any new development cooperation action addresses potential impacts on protected or vulnerable areas, ecosystem services, the introduction of alien species, and the use of fertilisers, pesticides or other chemicals. Programming has paid special attention to the potential for biodiversity protection and improvement. The EU and its Member States have played an active role in shaping the global 2030 Agenda for Sustainable Development. Implementing these commitments in the EU and supporting their achievement on a global scale will help to advance towards meeting this target. Reaching the international target of doubling biodiversity-related funding flows to developing countries by 2015 and maintaining them until 2020, as well as increasing the effectiveness of funding, will require continued commitment, better prioritisation and coordination with other donors. Achieving EU objectives will require further action to address the EU ecological footprint, and the effective implementation of recently adopted policy and legislation, with particular focus on compliance under the Nagoya Protocol. More efforts are also needed to implement provisions on biodiversity in recent trade agreements, to further integrate biodiversity objectives into EU trade policies and to encourage initiatives to promote sustainable trade. Insufficient financing was a major factor in the failure to reach the 2010 biodiversity target. Biodiversity aspects have been integrated to various degrees into European structural and investment funds, notably the common agricultural policy, cohesion policy funds and the European Maritime and Fisheries Fund. A robust analysis of the allocations to biodiversity will only be possible once all rural development and operational programmes are adopted. The LIFE programme remains a small but highly effective funding source for nature and biodiversity. It will also support innovative financing through the recently launched Natural Capital Financing Facility. The Commission has developed a process to track biodiversity-related expenditure in the EU budget in order to estimate more accurately the integration of biodiversity in programming. 44 A methodology has also been developed to ‘biodiversity-proof’ the EU budget, to ensure that spending has no negative impacts but supports biodiversity objectives. EU financing instruments are key in delivering on international biodiversity commitments, in particular through the Development and Cooperation Instrument and the European Development Fund, as well as under the Partnership Instrument. EU efforts to enhance resource mobilisation from these external instruments are enshrined in the ‘Biodiversity for Life’ flagship initiative (B4Life) launched in 2014. There has been considerable progress in establishing partnerships and engaging stakeholders and civil society. The re-launched EU Business and Biodiversity Platform supports the active involvement of businesses in the strategy implementation. The Biodiversity and Ecosystem Services in Territories of European Overseas (BEST) preparatory action contributes to the transition towards swift and easy access to funding for biodiversity protection and sustainable use of ecosystem services. The EU has also supported the Economics of Ecosystems and Biodiversity initiative, both within the EU and in developing countries, and has encouraged synergies between the Convention on Biological Diversity and other conventions. The knowledge and evidence base for EU biodiversity policy has been improved through streamlined reporting under the nature directives, and the mapping and assessment of ecosystems and their services, recognised internationally as the most advanced regional assessment scheme under the Intergovernmental Platform on Biodiversity and Ecosystem Services. Research and innovation framework programmes have an important role in the assessment of ecosystem services, in synergy with other EU funds. Horizon 2020 supports integrated assessments and science-policy interfaces with a focus on nature-based solutions. Cohesion policy funding for research and innovation is another source of support. However, major gaps in data and knowledge remain, in particular concerning the marine environment, the assessment of ecosystem health and links to ecosystem services and resilience. The integration of — and open access to — data from biodiversity monitoring and reporting under relevant EU legislation (such as agriculture, fisheries, and regional policy) needs to be strengthened as a priority for the remainder of the implementation period. EU external instruments have resulted in the creation of regional observatories in African, Caribbean and Pacific countries for better informing the decision-makers in natural resource management. The mid-term review assessing progress under the EU biodiversity strategy shows that the 2020 biodiversity targets can only be reached if implementation and enforcement efforts become considerably bolder and more ambitious. At the current rate of implementation, biodiversity loss and the degradation of ecosystem services will continue throughout the EU and globally, with significant implications for the capacity of biodiversity to meet human needs in the future. Progress has been made in establishing important policy frameworks: the new common fisheries policy, the Invasive Alien Species and Timber Regulations, and the introduction of biodiversity provisions in bilateral trade agreements, to name just a few. The reformed common agricultural policy provides opportunities for enhanced integration of biodiversity concerns but the extent of take-up by Member States will be decisive for success. The Commission has supported and complemented efforts made by Member States, regional and local authorities and stakeholders in enforcing environmental legislation, addressing policy gaps, providing guidelines, funding, promoting partnerships and fostering research and the exchange of best practice. There is a wealth of positive experience that can be a model for advancing towards the EU biodiversity targets in the remaining period until 2020. It is now urgent to intensify the implementation of measures across all targets and to ensure that the principles included in the policy frameworks are fully reflected on the ground. Achieving the 2020 biodiversity objectives will require strong partnerships and the full engagement and efforts from key actors at all levels, in particular with respect to completing the Natura 2000 network for the marine environment, ensuring effective management of Natura 2000 sites and implementing the Invasive Alien Species Regulation, and considering the most suitable approach for recognizing our natural capital throughout the EU. Achieving this target will also require more effective integration with a wide range of policies, by setting coherent priorities underpinned by adequate funding — in particular in the sectors of agriculture and forestry which together account for 80% of land use in the EU, as well as marine, fisheries and regional development. EU financing instruments can assist in the process. Achieving biodiversity objectives will also contribute to the growth and jobs agenda, food and water security, and to quality of life, as well as to the implementation of sustainable development goals globally and in the EU. (16) SEBI 023, EEA, 2015. (22) EEA Technical Report 6/2015. (23) JRC Report 2015, Mapping and Assessment of Ecosystems and their Services. (26) Many EU policies and legal texts have impacts (direct and indirect) on the state of biodiversity in rural areas. Target 3A focuses on the contribution of the common agricultural policy. (27) JRC Report 2015, Mapping and Assessment of Ecosystems and their Services. (28) European Red List of Wild Bees (2015). (29) Regulation (EU) No 1305/2013 of the European Parliament and of the Council. (30) The 73 rural development programmes (of 118 in total) adopted by 23.08.2015 cover three quarters of the budget and three quarters of utilised agricultural area. (31) The graph refers to EU-27 as it relates to the time before the accession of Croatia. (34) JRC (2015) Monitoring the performance of the common fisheries policy — STECF-15-04. (35) EEA Report No 2/2015. (36) Regulation (EU) No 1143/2014. (41) CBD Global Biodiversity Outlook 4.